Nashik, March 24: Nashik, one of the 48 Lok Sabha seats in Maharashtra, is in the north part of the state. 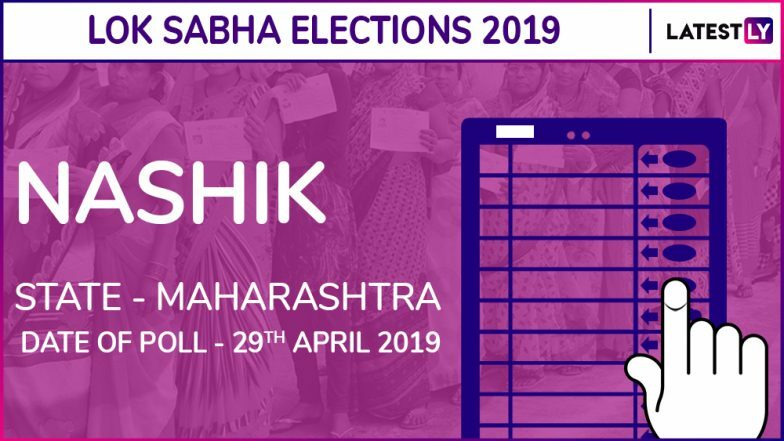 Polling for Lok Sabha election in Nashik parliamentary constituency will be held on April 29 in the fourth phase of general polls. The counting of votes will take place on May 23 and the election result of Nashik Lok Sabha seat will be declared on the same day. Hemant Godse Tukaram of the Shiv Sena is the sitting Member of Parliament from Nashik. The Shiv Sena has renominated Hemant Godse. In 2014 Lok Sabha election, he had emerged as a giant killer by defeating senior Nationalist Congress Party (NCP) leader Chhagan Bhujbal on his home turf. The NCP is yet to decide its candidate for Nashik Lok Sabha seat. The process of filing nomination for Nashik Lok Sabha election will begin from April 2. The last day for nominations would be April 9. Check Full Schedule of Lok Sabha Elections 2019. Scrutiny will be done on April 10 and the last date for the withdrawal of the nominations will be April 12. The Shiv Sena is contesting 23 seats out of total 48 seats in alliance with the Bharatiya Janata Party (BJP), which will fight on rest of the seats. The Congress and the NCP are contesting 24 and 20 seats respectively. Check Full Schedule of Lok Sabha Elections 2019.